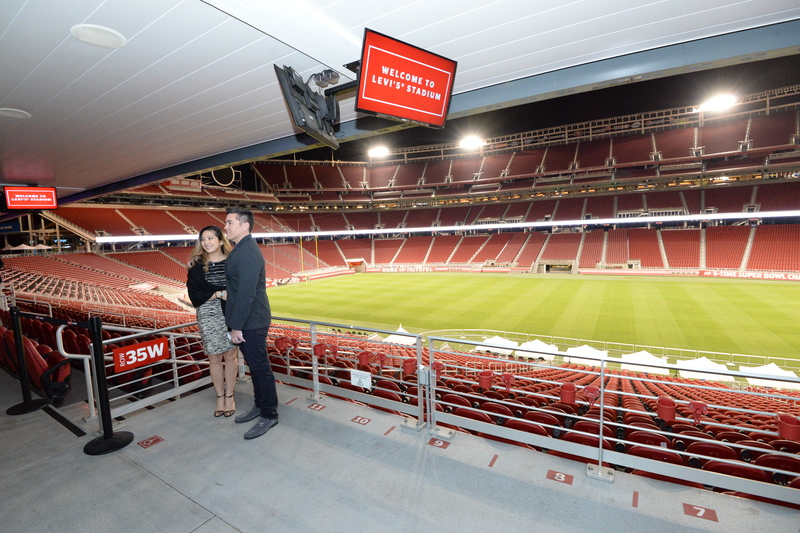 This year’s “One Team, One Dream” Night on the Town Gala got off and running earlier this evening in the United Club at Levi’s Stadium, home of this year’s Super Bowl. More than 300 attendees enjoyed a fun-filled evening of great food, a casino, dancing and more. Fittingly, Harker’s athletics programs were a major focus of the celebration, which was held largely to benefit Harker’s general endowment. Throughout the evening, photos of Harker alumni who currently play sports at the collegiate level were shown on dozens of screens around the room. Sponsors were honored by having their names displayed on the stadium’s screens, ribbon board and scoreboard. One of the highlights of the event was an entertaining “Chalk Talk” video in which Chris Nikoloff, head of school, played the straight man to chemistry teacher Andrew Irvine’s upbeat, motivational sports coach. Nikoloff stood at the podium delivering a diplomatic, salesman-like speech extolling the virtues of the new buildings, which Irvine translated into an invigorating pep talk, with uproarious results. This year’s silent auction had attendees bidding for prizes such as concert tickets, jewelry, a cruise, Disneyland passes and VIP packages to Harker events including the Harvest Festival and upper school graduation ceremony. Attendees also saw an exhilarating performance by the Harker cheerleaders and captured their memories of the night at the photo opportunity area.